WASHINGTON — While President Donald Trump’s new budget Monday reflects White House funding priorities, it has little if any chance of becoming law, as Democrats who control the House strongly disagree with what they consider the bookkeeping gimmickry accompanying it. 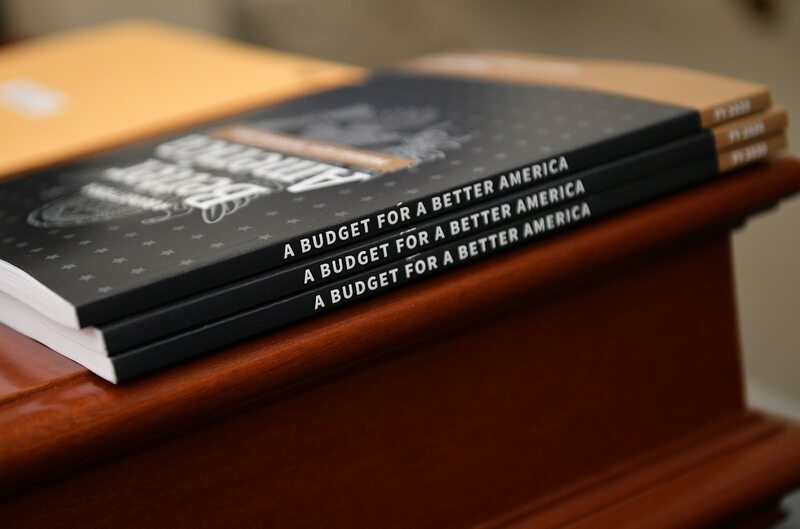 The White House officially released the broad details of its fiscal 2020 budget on March 11. It requests $750 billion for national defense, or $34 billion above the funds enacted for FY19, while it cuts the nondefense side to $563 billion, a 9 percent drop from FY19. For the Defense Department alone, there’s $718 billion, up $33 billion. “In order to preserve peace through strength, the Budget provides for increased end strength, bolsters our global force posture, and invests in the capabilities and domains critical to future conflicts, like space, artificial intelligence, and hypersonics,” Russ Vought, the acting director of the Office of Management and Budget, said in a statement Sunday night. To stay within the statutory budget caps, the budget funds national defense at the cap level, $576 billion, and shifts $164 billion of the defense spending to an overseas contingency operations, or OCO, fund, which some fiscal hawks will view as an accounting stunt. Rep. Mac Thornberry, the top Republican on the House Armed Services Committee and a key voice for increased defense spending on Capitol Hill, acknowledged the White House path here is a dead end. Appropriators reached a deal last year whereby they paired a Pentagon spending bill with its counterpart for labor, health and human services, education, and related agencies — a possible way forward now, Thornberry said. Asked if the large OCO request would poison those talks, Thornberry advised that lawmakers not "handwring over the massive OCO,” but focus on shoring up military readiness and countering Russia and China. The White House plans to rely on this strategy next year, too, to get around budget caps. Long-range plans for OCO show it as $156 billion in FY21, and then — after caps expire — $20 billion for the next two years, before it drops to $10 billion in 2024. Also controversial is it would use Pentagon funding for a border wall. Defense officials have promised lawmakers they will seek to backfill those funds, and there is a $9.2 billion “emergency requirements” line item “to address border security and hurricane recovery,” the budget says. The budget contains $8.6 billion for more than 300 miles of new border wall. House Speaker Nancy Pelosi, D-Calif., and Senate Minority Leader Chuck Schumer, D-N.Y., signaled Sunday that this is a fight for them. In seeking the wall funding, Trump would more than double the $8.1 billion now potentially available to the president for the wall after he declared a national emergency at the border last month in order to circumvent Congress — although there’s no guarantee he’ll be able to use that money if he faces a legal challenge, as is expected. The standoff over the wall led to a 35-day partial government shutdown, the longest in U.S. history. The budget arrived as the Senate readies to vote this week to terminate Trump’s national emergency declaration. The Democratic-led House already did so, and a handful of Republican senators, uneasy over what they see as an overreach of executive power, are expected to join Senate Democrats in following suit. Congress appears to have enough votes to reject Trump’s declaration, but not enough to overturn a veto. Trump invoked the emergency declaration after Congress approved nearly $1.4 billion for border barriers, less than the $5.7 billion he wanted. By doing that, he can potentially tap an additional $3.6 billion from military accounts and shift it to building the wall. That’s causing discomfort on Capitol Hill, where even the president’s Republican allies are protective of their power to decide how to allocate federal dollars. Lawmakers are trying to guard money that’s already been approved for military projects in their states, for base housing or other improvements. Leo Shane, Aaron Mehta and The Associated Press contributed to this report.